It’s mid-week and after a hectic few days celebrating the Jubilee with family, I am glad to be home. Typically, The Wildwood has other ideas about letting me sit down and relaxing. 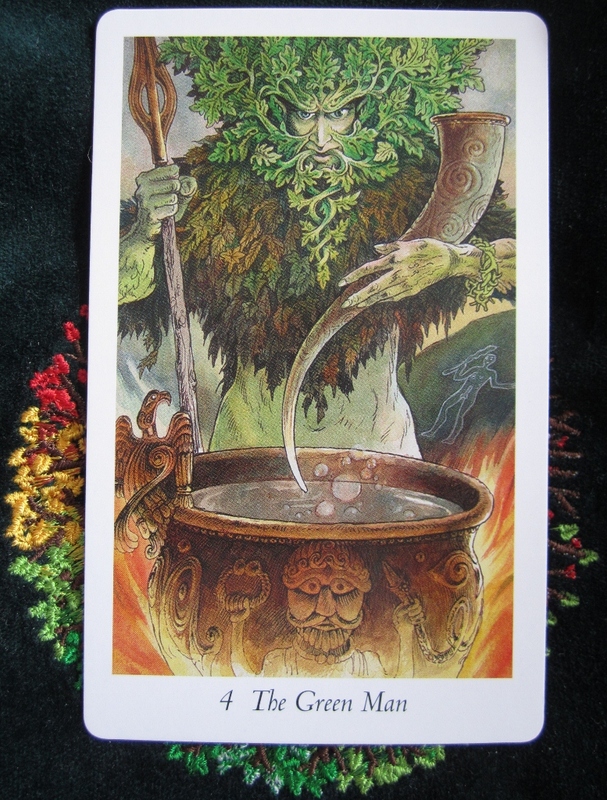 In answer for today, it’s given me Major 4, The Green Man (or the Emperor in RWS / WCS decks). The Emperor or The Green Man as he is known in this Wildwood, is a combination of all four kings. He’s emotional, fiery, wise, supportive, critical, insightful, sensitive, spiteful… he’s all of the Kings rolled into one. He can be your best friend and your worst enemy: Like any father. But what has he got to offer us today? Today, he’s about being that fantastic father figure. He can be cruel, he can be kind, like nature. I notice from the book that the mid summer solstice (Lithia) is his (and the Green Woman’s) time of the year: this is where they sit and this is where they rule. In the middle of the warm summer. He’s proud of what he’s accomplished, ever watchful. You can see it as he watches over the fecund cauldron that sits before him. He’s the masculine fertile one, the partner to The Green Woman. Nature decrees that male and female energies are needed to recreate life, each giving their own unique gifts to the off spring. So, today (though, rather late!) what new level of confidence and assertiveness have you found today? Have you found any? I have and by the bucket load! The patriarch has certainly had an influence on my day today. If you’d like your own personal reading, please contact me via this page.